Not every idea is as rewarding in practice as it is in theory. Here's one that is. 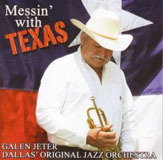 The plan was to have Dallas' Original Jazz Orchestra record an album of music written about or otherwise associated with the state of Texas, and the result is Messin' with Texas, a warm and snappy salute to the Lone Star State that should cause habitually imperious Texans to stand even taller than usual. On the other hand, many residents of the state may be hard-pressed to identify these emblematic songs, dressed as they are in elaborate new arrangements by Steve Sample, Curtis Fox, Paul Baker, Bob Biegler and David Bowman. Fox, for example, introduces "The Yellow Rose of Texas as a somber dirge before shifting gears and letting her dance to a lively Latin beat. By the same token, his arrangement of Don Swander's "Deep Thru (or in) the Heart of Texas abandons the melody, for the most part, in favor of an unwavering barrage of dynamic ensemble passages that even the most urbane cowpoke would never have envisioned. The other charts are equally provocative and, as a bonus, there are charming solos on the playful curtain-raiser, George Strait's "All My Exes Live in Texas, by Lone Star legends Maurice Anderson (steel guitar) and Billy Briggs (tenor sax), each of whom once played with iconic Bob Wills and the Texas Playboys. Composer Bob Nolan, of Sons of the Pioneers fame, is remembered briefly, via an old phonograph recording, at the outset of "Tumblin' Tumbleweed, nicely arranged by trombonist Bowman (who's listed as vocalist but doesn't sing a note). Sample scored "Rose of the Rio Grande and "All My Exes, Sample/Phil Kelly "On the Alamo, Baker the aberrant "Boogie Back to Texas, Biegler "The Eyes of Texas. DOJO, led by trumpeter Galen Jeter, is a snug, well-seasoned ensemble that has been on the scene for more than thirty years, so there's never a question about quality control. The soloists are quite impressive, especially trumpeter Ken Edwards, a standout on "Alamo, "Rose and "Eyes. Others who ride tall in the saddle are Bowman, fellow trombonist Fox, trumpeters Jeter and Chuck Willis, tenors Phil Cannon and Billy Eden, alto Stu Melis, guitarist Kim Platko and drummer Warren Dewey. If you're an admirer of all things Texan, this should please you no end. Even if you're not, there's much to admire and appreciate, as Jeter and DOJO take these shopworn tunes and make 'em shine like ceremonial sabers in the noonday sun. It's too bad they were unable to revitalize two more personal favorites, "San Antonio Rose and "Don't Fence Me In, but perhaps they're saving those for Volume 2. Let's hope so. Personnel: Galen Jeter, leader, trumpet; Terry Hager: trumpet; Byron Parks: trumpet; Ken Edwards: trumpet; Eric Wells: trumpet; Chuck Willis: trumpet (1, 2), Kerry Adams: trumpet (1, 2); Stu Melis: alto saxophone; Mark Lara: alto saxophone; Frank Mays: alto saxophone (1, 2); Phil Cannon: tenor saxophone; Billy Eden: tenor saxophone; Jonathan Beckett: tenor saxophone (4, 6, 8); Allan Beutler: baritone sax; David Bowman: trombone; Curtis Fox: trombone; Jon Hinton: trombone (1-6); John Allen: trombone; Randy Capshaw: trombone (1, 2); A.G. Robertson: trombone (3, 5, 7); Richard Powell: piano; Kim Platko: guitar; Jeremy Hull: bass; Warren Dewey: drums; Joe Carpenter (4, 6, 8); Kenny King: congas; Rusty Wells: percussion. Special guests: Maurice Anderson: steel guitar (1); Billy Briggs: tenor saxophone (1).